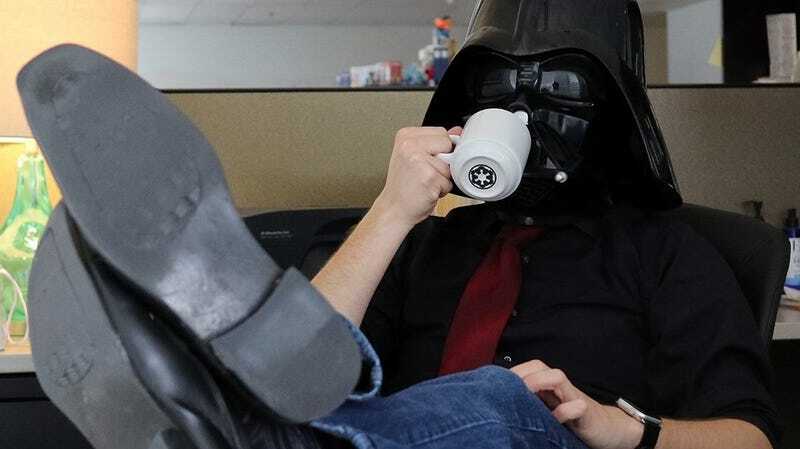 The Dark Lord of the Sith ponders business in a picture from GameStop’s Facebook page. A few weeks ago, America’s largest video game retail chain announced that it’s going to enter the comic book business. It was a move that took many by surprise. Now, we’ve got an interview with a GameStop executive who explains the thinking behind the decision. I spoke with GameStop’s director of consumer products Clint Walker last week over the phone, where he told me that the decision was based on the types of people who frequent their stores. In the conversation that follows, Walker paints the comics-selling initiative as an evolution of GameStop’s current business, and also explains how the company is planning to step into a whole other area of pop-culture retail. io9: Why does GameStop want to start selling comic books? Clint Walker: I’ve been in my role as the director of consumer products for the last few years. We define consumer products as toys and collectibles. The decision to start selling comic books in the US domestic GameStop and ThinkGeek stores is because, for us, it’s a very natural adjacency. We’ve got that collector fan in our environment. And the great thing there for us is the purchasing power we have, [and] the loyalty programs we can bridge across to the comic book fans, so it’s a true opportunity. We’ve hired a few subject matter experts on our end. They’ve got a couple great years of product knowledge that we can really lean against. But the opportunity for us is we’ve got a great selling culture. Our number-one focus for our stores is building relationships, which we just see as a natural fit. As for comic shops themselves, we know it’s an opportunity. Some of our competition has gone to the wayside, like Hastings [note: the national entertainment retail chain that filed for bankruptcy in 2016] or some of the other, smaller operations. But, in general, [this move] very much aligns with our goal of being the fast fashion in pop culture. There’s just a tremendous opportunity as we continue to grow our partnerships with Marvel and DC and some of the anime properties we’ve been introducing. Talk to me about those relationships with Marvel, DC, and the other publishers. I assume you’re working through Diamond Distribution to get individual issues in every week. Or, are you just sticking to graphic novels and collected editions? What’s going to be available on the shelves? Walker: Yeah, we’re going to align with Diamond. We’re doing tremendous business with them to date, more on the collectors’ statues, action figures, and the collectible side of the business. We’re going to be [rolling comics out] in a small subset of stores, probably in the next couple of weeks on both the GameStop and ThinkGeek side. Okay, so where are these test stores located? Walker: They’re going to be, actually, nationwide. They won’t be centralized. With the ThinkGeek stores that we’ll be testing in, there’s a large base in Florida and Texas and the Northeast. But as you know, Game Stop stores are pretty much nationwide today. How will the in-store display setups change to accommodate comics? Walker: We will actually be leveraging a spinner rack; it’s a vertical, free-standing spinner rack. And that will be our primary destination. All four sides will be dedicated to comics. And we’ll be expecting to receive weekly shipments, and truly just try to create more of a sense of urgency around the category. We don’t plan to replenish at this time. We actually expect our initial purchases could be the opportunity, and really keep it lean and mean. Does that mean you won’t be doing a back-catalog strategy where you buy back and stock older releases, like you do with video games? Walker: There’s potential. But I think for the most part, we understand that the comic customer can be extremely generous but also a little harsh in terms of the in-store environment. So we’ll be looking at those types of opportunities, but on the initial go, it’ll most likely be newly released product. But we’ll also be looking at how do we scale and expand based on what we’ve learned early on. For video games, GameStop tends to work on exclusive bundles with hardware manufacturers like Sony and Microsoft and Nintendo. Do you see any kind of similar packaging programs as opportunities you might pursue with comics publishers moving forward? Walker: You know what, you bring up an interesting point. So, we have had comics in our environment around certain titles. With Injustice 2 last year, I know we actually leveraged our relationship with WB around the launch of the game to give some promotional gifts in our stores. I’ll give you another example: This year, Spider-Man is coming from Insomniac Games for Playstation… now that we’re kind of in the role of a pop-culture business, it’s really [about] expanding opportunities across all the categories that we manage. To truly bring something unique. So it’s a really exciting time for us when you see all the things that Marvel and DC are doing in the video game space, that we have an opportunity to build that basket and truly cater to the ultra-fan customer. Funko Pop figures sold as part of the Marvel Gamerverse initiative. You may realize, you may not, we’ve actually released an exclusive brand with Marvel called Gamerverse. So, essentially Marvel has done the research in terms of segmenting their consumer base, and we have a brand called Gamerverse, which are products that will be launching with the Spider-Man video game from Insomniac this September. What they’ve been able to do in terms of going to market with that demographic, you know, segmenting out Marvel as a high propensity around video gamers is really incredible. What’s in the window of experimentation that you’re leaving open for this new venture? You can put comics in stores nationwide, do you give a full financial quarter to see if they’re successful? How long are you willing to take this chance? Walker: Yeah, no—we’re actually committed in our agreement. It will be multiple quarters. It’s not going to be a short term solution. We understand that, early on, there could be some pain points involved. But, we’re absolutely committed to understanding this market and bringing something unique and different in the market that doesn’t exist today. For us, the biggest opportunities are actually pre-order and trade. Most of our external messages are really about the circle of life, and how you can pre-order at GameStop and bring in trades for purchase of other products. We do that well now, from new video games to pre-owned, and, more recently, consumer goods and collectibles. I think that you’ll see us get into the position of generating some excitement around pre-order and trade in the [comics] space, as well. How you think Game Stop could improve on the shopping experience found in more traditional comic book stores? A still from a GameStop investor presentation video. Walker: You know, that’s a really good question... I’m going to think about that for a second. I had mentioned our merchandising team is diversifying along with our categories that we manage, and we have brought in a few subject matter experts that truly pioneered comic book programs at other retailers. So that’s one. But two, I think for us, we know that there’s a huge opportunity to have a nationwide partner with Diamond that doesn’t exist today. I say this with all due respectfulness, but I understand that these fans, these consumers, these loyalists can be very fickle about where they purchase their product if they’re not happy with the shopping experience. Walker: We brought in a gentleman named James Parker, who actually had previous roles at Hastings as well as Thinkgeek.com. He was one of the lead merchants in pop culture for Hastings, and is a merchant on our team that really came in and brought us the [comics-selling] opportunity as something that could be scalable. Is Diamond going to be your sole partner in terms of acquiring more comic books? Are you going to work with bookstore distribution channels, at all? Walker: I think we’ll expand, but early on, Diamond is our primary partner. There’s no signs of exclusivity discussions, but they’re currently working fine. Comics is like a hand-selling business, where retailers evangelize to customers. It’s a little bit different than video games. Do you feel like you’re going to have to do different trainings with consumer-facing staff to message comics? How do you plan to train up staff to service that different market? Walker: Well, our primary communications vehicle will be our Power-Up Rewards program. You know, it’s one of the largest loyalty member databases in the US for any retailer, and I think that’s where we’re able to also segment our loyalty programs to define who is purchasing what products from us. As an example, we’ve been able to pull together the Funko Insider Club, which actually targets to that demographic first. Or on our Pokémon side of the business, we’ve done tremendous business with Pokémon on the video game side, but we’re able to sell Pokémon Center products through our Pokémon loyalty database, as well. So I think that’s where we’ll start to understand who’s exactly shopping in our environment, but you’re right, there’s a difference. The key element here is our associates, and we actually know that our associates are one of our greatest assets. So there’s a huge opportunity to build that trust and reliability and feedback that the fans are looking for in terms of that tribal knowledge. News is breaking about GameStop looking to be acquired. Does this change the mindset you guys have toward selling comics? PR spokesperson: Evan, we can’t touch that.